Los Angeles is more than just Hollywood and palm trees, it is also a major cruise port for vacationers heading to Mexico, Panama and beyond. And although the cruise terminals are not in L.A. but rather south of the city, visitors will have plenty of time - so long as they have transportation - to explore the City of the Angels and take in the beautiful beaches, the wonderful museums and of course, Disneyland and Knott's Berry Farm. If you insist on visiting the major motion picture studios and perhaps getting a glimpse of a megastar, of course you can fit that in as well. Los Angeles cannot be fully explored in a day or two, but there is plenty to keep the motor running while you are awaiting departure for Mazatlan or wherever. Cruises from Los Angeles depart either from the modern World Cruise Center facility at San Pedro or at the Carnival Cruise Terminal in Long Beach. Both are about 20 miles south of downtown, but there are shuttle buses and taxis ready to take you to the center of L.A. and its attractions. For those catching flights after their cruise is completed, there is even a baggage check service at the San Pedro terminal. Rental cars can also be reserved for pickup at the cruise terminals; however, this may incur an extra fee on top of the daily rate. The list here is never-ending, as the region has many attractions to offer. 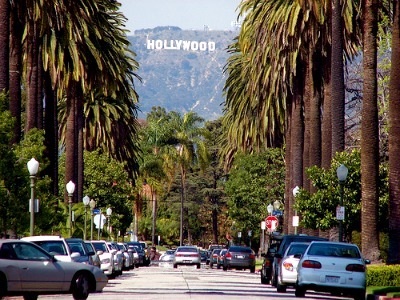 Of course, the main feature, so to speak, are the visits to Hollywood, Paramount and other motion picture studios. All have tours and shuttle trolley rides and visitors can get up close and personal with the stars of yesterday and today, at least the cardboard cutout variety. Some of the lesser thought of attractions are among the best, however. 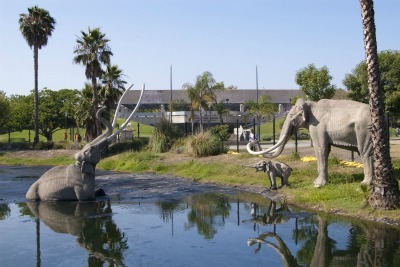 Take a trip to the famous Rancho La Brea with its amazing tar pits, a reminder of ancient life on earth. Here you see where the gas in your automobile comes from. Take a trip by taxi or bus to the Mt. Wilson Observatory north of Pasadena and get a stunning view of the metropolitan area, at least when the air quality allows it. From Sunset Boulevard in Hollywood get the best view of the famous Hollywood hill sign. At the Griffith Observatory and Planetarium north of downtown, gaze though a powerful telescope and spend hours touring the astronomy museum. This is excellent for families, who can then head to the nearby Los Angeles Zoo. And the already mentioned Disneyland speaks for itself. Remember that both Disneyland and Knott's Berry Farm are in the Anaheim area, far away from downtown L.A. and destinations such as these can take time on the roadway, thanks to the congested traffic. In and around Hollywood and on Rodeo Drive there are a number of establishments that are favorites with the locals. The Musso and Frank Grill is the oldest restaurant in Hollywood and is excellent for lunch. The Ivy Restaurant on North Robertson Blvd is a favorite for hanging out and looking for celebrities. Closer to the cruise terminals is the equally renowned L'Opera Ristorante which serves up the best in Northern Italian cuisine, especially their fantastic seafood plates. And one of the most beloved institutions in the entire Southern California region is Pinks, quite possibly the finest hot dogs in America. Located by the Beverly Shopping Mall, it draws huge crowds from opening to closing time. Los Angeles is such a sprawling metropolis that a rental car is a must. It's either that or spend a lot of time transferring between buses or spending all your vacation money on taxis. Rental cars can be reserved for pickup near the cruise terminals, and once downtown, the subway system will be of some help. There are also shuttle services from the cruise terminals to a limited number of area hotels. Or course you can act like a movie star and hire a limousine if you really want to. Visitors to Los Angeles should allow plenty of time to get from one location to another, not only because of the traffic but also because of the great distances involved. The weather is usually sunny but not too hot in the summer and rather mild in the winter. Places that have WiFi are found everywhere, and there are plenty of telephones at the cruise terminals. Exchanging U.S. dollars for foreign currency is not necessary for cruise vacationers; American money can be used at Mexican ports. A scene in Los Angeles. Can you see the Hollywood hill sign? 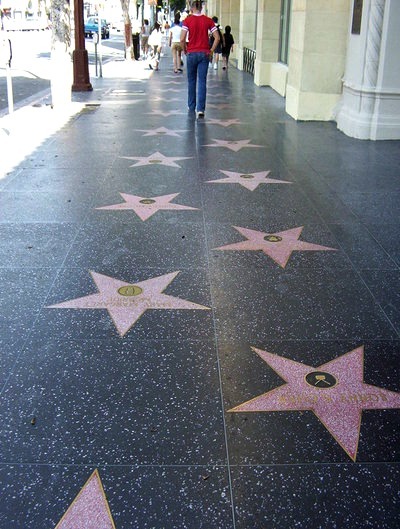 The Hollywood Walk of Fame. Who knows, perhaps your name will also be here someday. 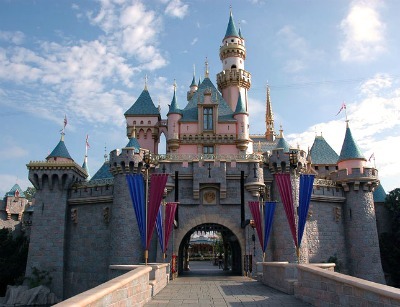 The Disneyland in L.A. - a great place for friends and families. The tar pits at Rancho La Brea.